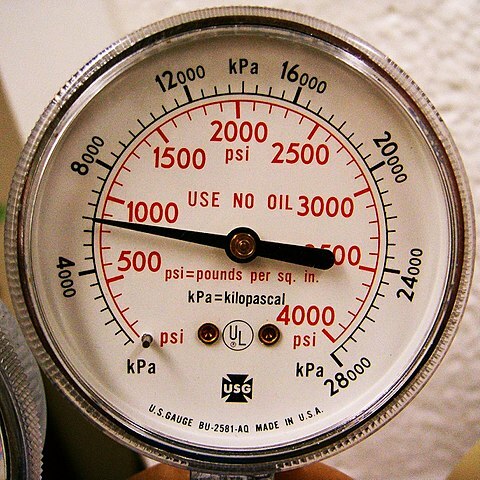 Pressure, regardless of how it is produced, can be measured and specified in many different ways but is commonly measured in “pounds per square inch (or psi)”. The SI unit of pressure is pascal (newton per square meter), which equals to 0.01 millibars. Pressure is defined as force per unit area. The effect of force on a surface depends on how the force is applied. Like temperature, pressure is a fundamental design parameter. It can be applied in all directions, in just one direction, or in several directions. For example, if a person is walking barefoot on the snow, he will most probably sink down well before than if he is walking with his snowshoes on. The force applied on the snow is the same on both the instances, but the force per unit area is different. It reduces the pressure when that person is wearing the snowshoes because it spreads the force out over a much larger area. PSIG refers to the pressure specified by a gauge, hence the name – pounds per square inch, gauge or psig. The ‘G’ here means it is a relative measurement. Let’s take a good look at the two to better understand how they differ. The recommended unit of pressure is Pascal which is the pressure produced by a force of 1 Newton uniformly distributed over an area of 1 square meter. However, several other units of pressure are widely used for pressure measurement, of which, the most common is pounds per square inch, commonly known as “PSI”. It is a non-SI unit of measurement of pressure, like an alternative unit of pressure. PSI refers to the amount of force exerted on an object expressed in pounds of force per square inch of area. PSI unit is widely used in industrial applications such as tire pressure. PSIG refers to the gauge pressure, expressed in pounds per square inch gauge. It is a unit of pressure relative to the ambient pressure or atmospheric pressure. It is the measurement of pressure when local atmospheric pressure is not factored in. The gauge pressure is applied when the pressure inside the system is greater than the atmospheric pressure. And atmospheric pressure is the pressure exerted by the weight of the atmosphere or in simple terms, the pressure within the atmosphere of earth. PSIG = PSIA – Atmospheric Pressure, where PSIA is Absolute Pressure. Pounds per square inch, or psi, is a non-SI unit used to measure pressure in the Imperial system of measurement expressed as pounds of force per square inch of area. Pressure is typically measured in Pascal, after the renowned French scientist Blaise Pascal. In simple terms, PSI refers to the amount of force exerted on an object with area of one square inch. PSIG, or pounds per square inch, gauge is a unit of pressure relative to the surrounding atmospheric pressure and the “g” in psig means it’s a relative measurement. PSIG is also referred to as gauge pressure hence the name. PSI can be converted to any number of units used to measure pressure such as Pascal, which is a Newton per square meter. It is widely used British and American unit of measurement of pressure. 1 psi equals to 6894.76 pascals or N/m2. 1 foot of water equals to 0.433 psi pressure and 2.31 feet of water is equivalent to 1 psi pressure. On the contrary, psig indicates that the pressure is relative to atmospheric pressure. 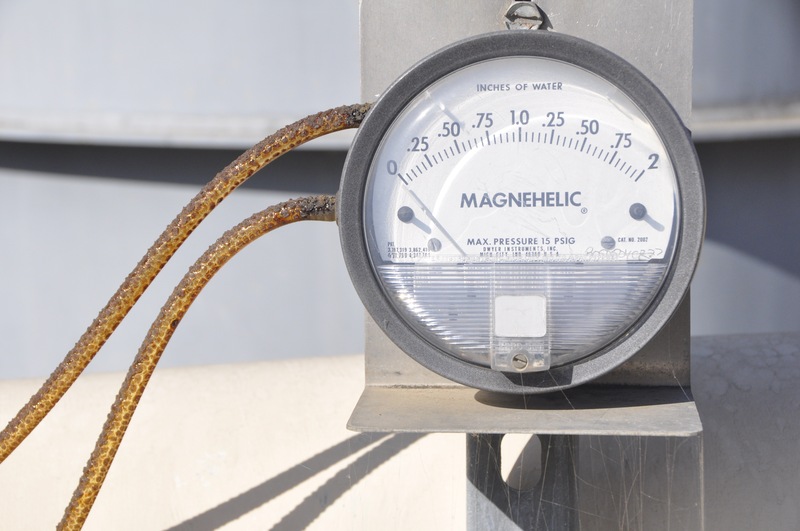 The gauge that reads psig will read 0 pounds per square inch at sea level when it is not connected to a pressure source. Air conditioning and refrigeration industry more commonly use a gauge that reads pounds per square inch gauge. A gauge pressure is sometimes used to ignore the effects of changing weather, depth, and altitude. This references measures pressure relative to the atmospheric pressure. Tire pressure is typically measured in psi as well as other test and measurement activities. PSI unit can be used as a non-SI unit of measurement for industrial applications such as fuel distribution and storage, waste water management, and so on. When a pressure gauge reads 10 psig, the actual pressure inside the gauge will be 24.7 psia that is psig reading plus atmospheric reading. Pressure is the amount of force exerted on an object divided by the area (in square inches) over which the force is exerted. Pressure can be measured in many different ways but the common unit for measurement of pressure is pounds per square inch (PSI). It’s a non-SI unit of measurement of pressure used by the Imperial system of measurement mostly by British and American. Although the SI unit of pressure is Pascal it is commonly measured in “PSI”. PSIG, on the other hand, is the pressure specified by a gauge relative to the surrounding atmospheric pressure. The g here means it is a relative measurement. Conversely, PSIA (pounds per square inch absolute) is the measurement of pressure relative to a vacuum. Technically, both the units are relatively same and they do not affect anything unless you are way above sea level or let’s say where there is extreme altitude involved. Sagar Khillar. 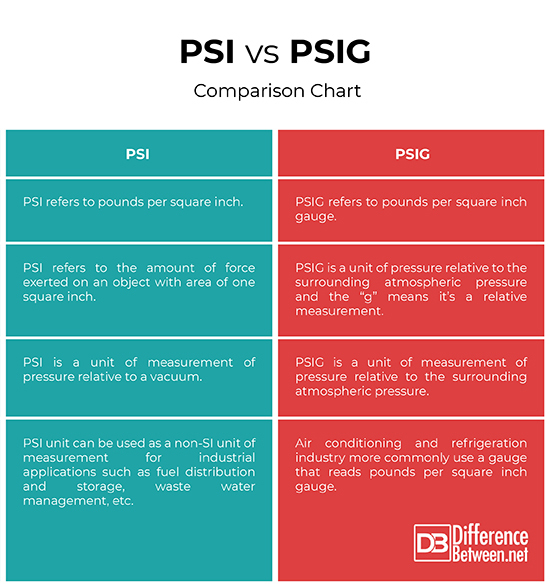 "Difference Between PSI and PSIG." DifferenceBetween.net. September 28, 2018 < http://www.differencebetween.net/science/difference-between-psi-and-psig/ >.